What’s your biggest challenge in Children’s Ministry? Recruiting leaders? Safety and security? Planning events? All of those are huge ones for me too, but I have to say my biggest challenge is helping parents. do. That’s the way it should be. I don’t want replace a parent’s spiritual influence, but I do want to help them. Honestly, though, some days, I just don’t know where to start. 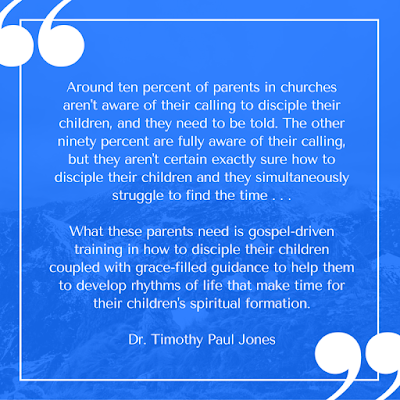 his stuff when it comes to equipping parents, Dr. Timothy Paul Jones, professor, pastor, dad and author of several books on family ministry. can do in my church to tell parents, train parents and help parents make the most of the time they have with their kids. If you’d like to learn more, I’d like to invite you to join me for a couple of great opportunities to hear from some of the most experienced voices in family discipleship. May 2-3, join thousands of other family ministry leaders for D6 Days, a free online event. This is a great chance to learn from the best of the best in family ministry right from your phone or computer. At D6 Days, Children’s, Student, Family Ministers and Senior Leaders can all catch a fresh vision for how to reach families at this two day online conference. If you’re in the central Kentucky area, come join us at Southland Christian Church, Wednesday, May 25th to meet Timothy Paul Jones, Ron Hunter and other experts in the area of family ministry on the D6 Connect Tour. It’s only $19 to hear three awesome speakers, connect with other ministry leaders and enjoy lunch together. You can learn more about the D6 Connect Tour and register here. I hope you’ll join me for one or both of these of these experiences to discover what God may in store for each of us to bless families for generations to come.